More than ever, consumer electronics are defined by disposability. Cameras become obsolete nearly as soon as they appear. Computers, MP3 players and cellphones are endlessly churned out and touted as necessary replacements for current models (or their non-replaceable batteries die). In the frenzy for the latest and greatest, we often forget that what we throw out does not disappear, is not magically recycled. 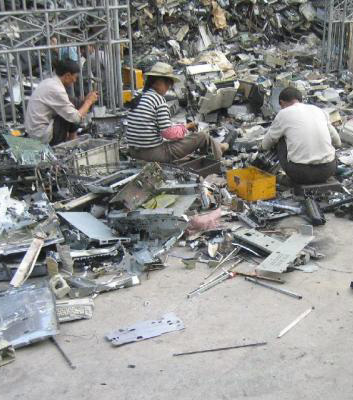 Instead there are close to 40 million metric tons of it floating around, poisoning water supplies, contaminating soil, and exposing to health risks people in developing countries who earn a living dismantling and salvaging the electronic waste that ends up in their backyards. Could a global initiative led by some of the worst offenders solve the problem? Yesterday marked the formal launch of StEP (Solving the E-waste Problem), a program headed by the United Nations to unite a number of manufacturers, governments, universities and NGOs from around the world to create standards that would lessen the environmental and health effects of our current approach to electronics. Besides attempting to standardize recycling practices to harvest from discarded gadgets valuable components (such as indium, a by-product of zinc mining primarily used to create transparent electrodes such as those in LCD screens and which is now more valuable than silver), the initiative focuses on making devices less likely to be thrown out in the first place. The industry members, including Dell, Hewlett-Packard and Microsoft, will work to design better-quality products with parts that can be more easily upgraded on an individual basis. seek information about what the college and I need to submit my academic and social expectations and economic, thanks for sharing the information. I think new york has large global institutions and from there my interest from schools in one of these.